NOTE: HAVANA'S CLOSED ~OCTOBER, 2010, AFTER SERVING AT THIS SITE FOR 8 YEARS. THERE'S NO WORD ON WHY. TASTE OF CHICAGO HAS OPENED AT THIS SITE. 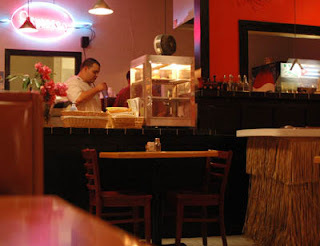 Havanas is one of the nicer Cuban restaurants in the Naples-Fort Myers area. 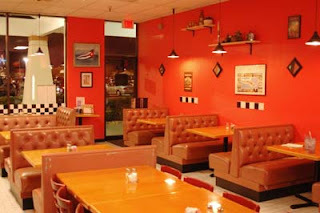 The red walls with Cuban posters, faux white brick floor and happy customer- filled tables welcome you to a banquet. Chef Oscar and his family have been feeding guests in Naples for a dozen years, 5 tucked away in this strip mall, next to Em-On Thai, and a couple sour orange tosses across from NCH Wellness Center. The prices must come from Havana (Cuba) today, or a 1970's menu. Filling sandwiches can be had from the $5.99 Midnight, through $8.99 for the Crispy Grouper Sandwich, with a favorite being the "priciest" $9.95 Havana Especial, with Jamon Bolo, Serrano Dulce, Pavo, Pierna de Puerco, Tocineta, Queso y Chorizo. Other offerings include the $6.99 Frita Cubana, a Cuban Style Burger with Grilled Onions, Potato Sticks and Chorizo Sausage slices. I first tried lunch, and not one word of English was initially spoken among the other patrons- a good sign for me in Naples, a pricey haven for "steak and potato, please" Midwesterners. The waitstaff are bilingual and knowledgeable. 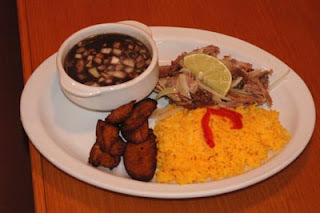 I opted for the special of Oxtail Soup, with yellow or white rice, tostones or plantanos maduros for about $10. The oxtail portion was enough for two people, and the tender meat was just falling-off-the-bone right, as if simmered for several hours. The sweet plantains were better than many desserts. I also sampled the superb garlicky Lechon Asado, or Slow Roasted Pork, for $6.99, and it tasted like the juicy whole pig roasts that friends in Miami baked for 8 hours in a backyard pit. 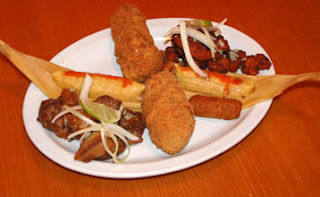 For dinner, I and my guest enjoyed the flavor and crispness of the Bandeja de Matanzas sampling appetizer ($12.99), with its' Corn Tamales, Crispy Chicken and Pork tenders, Pork Croquettes, and the large crispy fried Yucca and Potato with a tender pulled pork filling. (Chef Oscar graciously agreed to let us take a photo of him holding the Bandeja de Matanzas.) The thin, flavorful Palomilla Steak ($11.99)was the savory hit of the evening, even overshadowing a dinner portion of the Lechon Asado (Roast Pork). Styrofoam clamshells came to the rescue, as the huge portions insisted they be finished the next day. 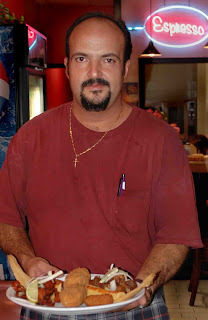 I spoke to some of the other patrons (at lunch), and it was clear that this is "Cuban home cooking" at its best in SW Florida, and they were regulars to prove it. 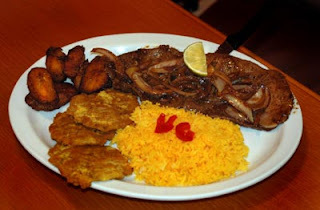 To learn more about Cuban cuisine, try recipes at http://icuban.com/food/ or Mary Randleman's Memories of a Cuban Kitchen.